The biggest highlights this year were dominated by Melbourne’s top architectural masterpieces. Whilst some expressed disappointment at the limited number of projection art pieces between these landmarks, the quality of work at these key locations held up as some of the best produced so far. In past years, visitors have been treated to an array of work from international artists. This year however the curatorship looked to internationally recognized Australian artists for some of the most important pieces. 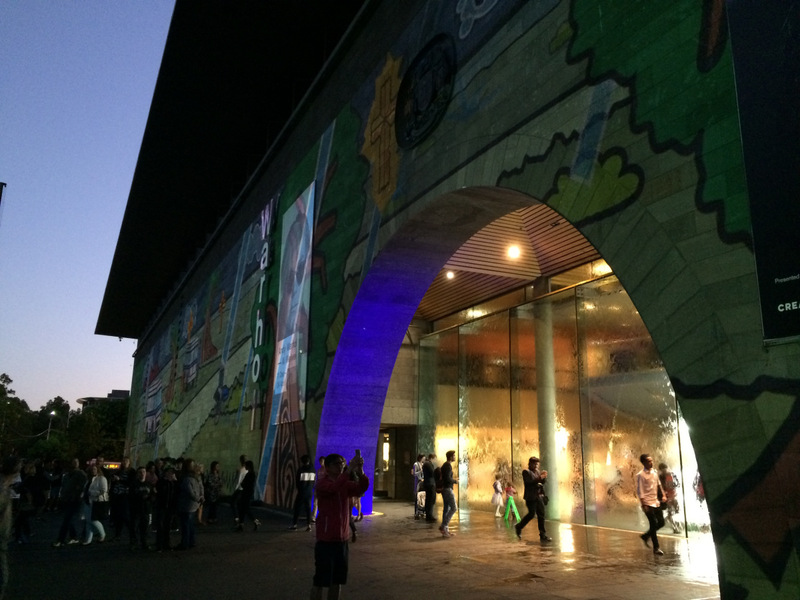 Projected upon the monumental bluestone of the National Gallery of Victoria, indigenous artist, Josh Muir, along with Ample Projects produced a beautifully animated story of Melbourne’s indigenous people. Entitled ‘Still Here’, this piece perfectly resonated with the time and place that it was created for. The imagery of animated trams rolling along the St Kilda Road facade, reflected off the pools of water was truly a memorable experience. Inside the gallery, behind the water wall, the NGV was open for exploration the entire night. The extraordinary exhibits, which are still available for viewing, included the Ai Weiwei and Andy Warhol exhibition, a couple of extraordinary inflatable rabbits by Michael Parekowhai, and the NGV pavilion by John Wardle Architects. In past years it was the Forum Theatre, and adjoining buildings on Flinders Street which were given the ‘flashy treatment’. This year it was Federation Square’s turn. Again it was fantastic to see that an indigenous artist had been commissioned for this technically challenging task. 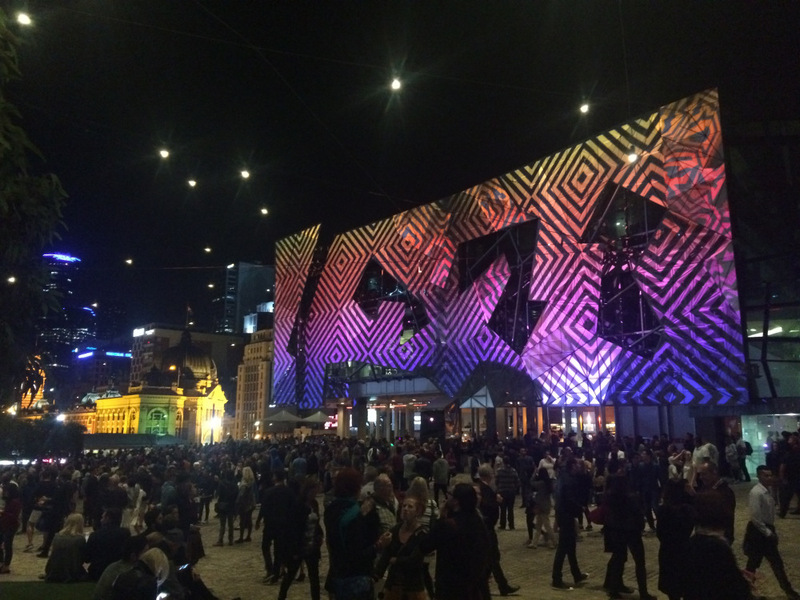 Reko Rennie with The Electric Canvas produced an artwork of vibrant patterns specifically tailored for the complex geometry of Federation Square. As we have come to expect from White Night, the State Library of Victoria was a dazzling spectacular both inside and out. From Swanston Street the Library dazzled in rich graphics, architectural sketches and photographic imagery. The facade illumination and animation experience entitled ‘Landscaping Architecture’ was put together by Amanda Morgan and James HH Morgan with music by DJ JNett. 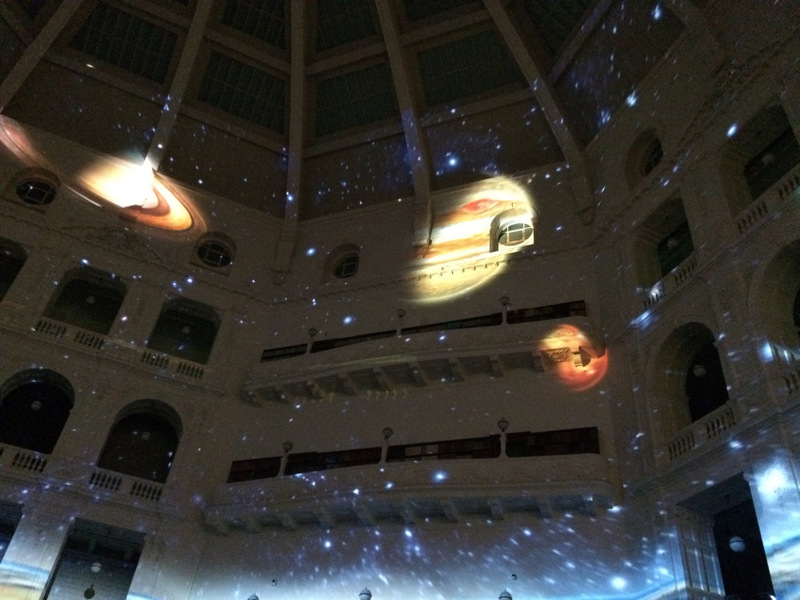 Within the iconic reading room, visitors were taken on a journey through the spheres of human knowledge, in a celebration of the wonders available through libraries. This brilliant piece entitled ‘Ideation’, was the creative work of Nick Azidis, Lisa Greenway, Adem Jaffers and Bentley Dean. Perhaps the most successful piece of this year was the full facade masterpiece on the Royal Exhibition Building. This work was a collaboration between an indigenous group from Ballarat known as the Pitcha Makin Fellas and the Portuguese creative studio OCUBO. The result was a masterful piece of storytelling, animation and soundscape upon the backdrop of Australia’s first World Heritage listed building. For those who attended White Night in 2015, there was a similarity between this piece and the piece entitled 4 Elements. Both pieces described the changing of the seasons and yet the power of the Australian story told by Australians, with the animation created specifically for this building, made this an even more compelling installation. 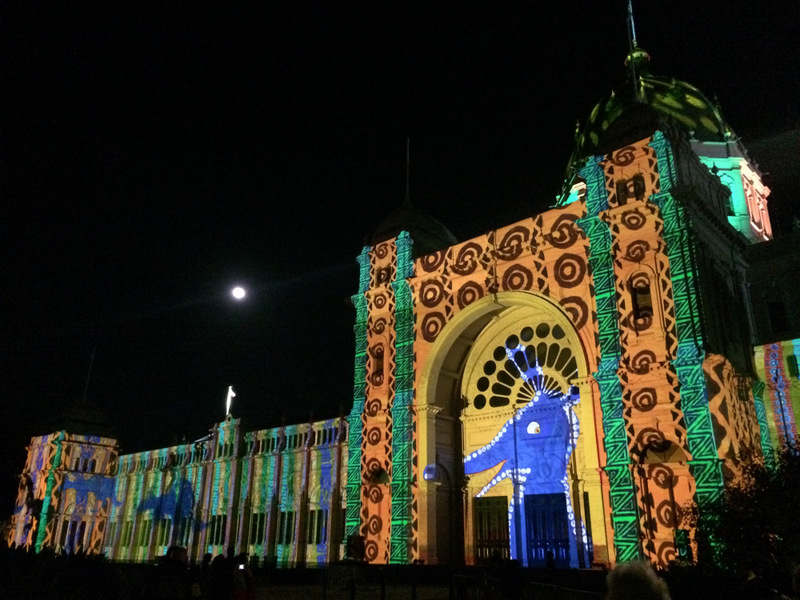 White Night is a Melbourne event like no other. It is a celebration, which is not based on sport, but instead upon art and architecture. With a record attendance this year of well in excess of 500,000 people, White night 2016 is a testament to Melbourne’s credentials as a city that values creativity and diversity. As always thanks must go to former Premier Ted Baillieu who had the foresight to make White Night Melbourne possible back in 2013, as well as those like current Premier Daniel Andrews for crucial support in backing this cultural behemoth. Michael Smith is a principal at Ateiler Red+Black. This article originally appeared on the Red and Black architect blog. Michael also operates the Rate My Building website.